One of the most influential literary figures to emerge from Argentina in the twentieth century, Julio Cortázar is best remembered for his experimental 1963 counter-novel Hopscotch (Rayuela) and for his short story “Blow-up,” on which the 1966 film by Michelangelo Antonioni was based. Cortázar was officially exiled by the Argentine junta in the 1970s and spent the rest of his life in France, where he died in 1984. 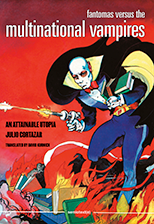 First published in Spanish in 1975 and previously untranslated, Fantomas versus the Multinational Vampires is Julio Cortázar’s genre-jumping mash-up of his participation in the Second Russell Tribunal on human rights abuses in Latin America and his cameo appearance in issue number 201 of the Mexican comic book series Fantomas: The Elegant Menace. With his characteristic narrative inventiveness, Cortázar offers a quixotic meta-comic/novella that challenges not only the form of the novel but its political weight in contemporary cultural life. Needing something to read on the train from Brussels (where he had attended the ineffectual tribunal meeting), our hero (Julio Cortázar) picks up the latest issue of the Fantomas comic. He grows increasingly absorbed by the comic book’s tale of bibliocide (a sinister bibliophobic plot to obliterate every book from the archives of humanity), especially when he sees the character Fantomas embark upon a series of telephone conversations with literary figures, starting with “The Great Argentine Writer” himself, Julio Cortázar (and also including Octavio Paz and a tough-talking Susan Sontag). Soon, Cortázar begins to erase the thin line between real-life atrocities and fictional mayhem in an attempt to bring attention to the human rights violations taking place with impunity in the country from which he was exiled.